I've had this dream of planning a conference of oddball and kooky coloring book makers. It started immediately after I found Claire Siepser and Crystal Vielula's coloring books at Bluestockings Bookstore a few years ago. It seemed a Herculean task to pull off a whole conference, so we're starting with a one day event in the Bay Area because that's where they both live. There will be no mandalas or decorative plants to color with meditation pencils. If you live near there, I hope you can come. Send your friends. I would love to meet them. WHO: Coloring book renegades Jacinta Bunnell, Claire Siepser, Crystal Vielula and you. WHAT: An evening of political play, art, DIY mischief, camp, gluesticks and coloring. HOW: The artists will bring coloring pages from their own books and other silly coloring books. Come and color, build exquisite corpses or make collages. Let’s make a big radical colorable exquisite corpse or a 100-page Franken-book. We bring the crayons, paper and glue stick. You bring your imagination. Long before coloring books for adults were a craze, artists have been creating unique coloring projects which provide humor and cultural commentary for people of all ages. Folks like Jacinta Bunnell, Crystal Vielula and Claire Siepser explored queer identity, politics, feminism, DIY fashion and other themes as far back as 2001. Join these artists as they share their most recent work and collaborate with participants to assemble all sorts of coloring books into unexpected declarations of the coloring book of the future. A pop-up art sale will ensue since the artists will have several original paintings and prints available for one evening only. $10 covers materials and snacks. Crystal Vielula graduated from CCA in Fashion Design. She is the author of Urban Animals Street Style Coloring Book and Farm Fashion Coloring Book. In her public murals she aims to promote gay pride and the acceptance of the LGBTQ community. Claire Siepser is the author of The Coloring Book of Unfortunate Situations and The Coloring Book of Terrible Decisions. She has fancy degrees in art buried under a stack of paper somewhere. She lives in Oakland and likes puddle jumping, bonfires, well-sharpened pocket knives and making things better. Jacinta Bunnell is the author of The Big Gay Alphabet Coloring Book and Sometimes the Spoon Runs Away With Another Spoon. She lives in Upstate New York. Invite your friends on Facebook and help us spread the word. Are you frustrated with the lack of gender-fluid, feminist and queer visibility in youth media? Do you love coloring books? Here is a place to let your visions for a better, more inclusive world get back at all the fairy tales that have hurt your feelings. This workshop is like spending time in the craft cabin at your favorite feminist summer camp (does this exist?!). Using found images from pop culture, you will transform these ordinary images into your own gender-tastic coloring book. Because so much of youth media does not include transgender, queer, gender-fluid and feminist characters and ideas, we will deliberately work to change this. Don't miss the chance to make friends, cut-n-paste with a real glue stick, and change the direction of pop media. No longer will there be a shocking lack of narratives for gender outlaws! Age 9-adult. This workshop is part of Meadowfest at High Meadow School. 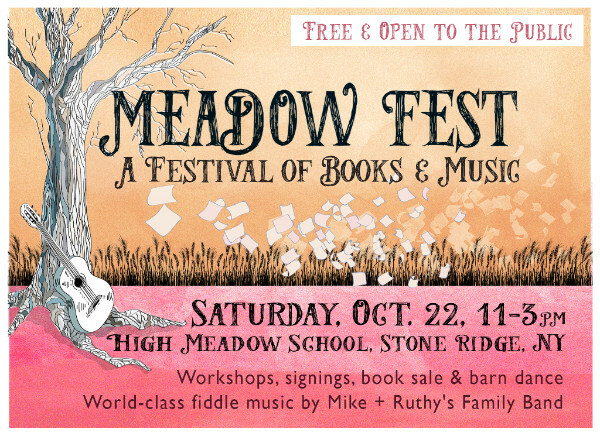 This Fall Book Fest & Barn Dance will include readings by noted Hudson Valley authors of books for children and young adults, workshops featuring authors and illustrators and a Barn Dance with local, world-class fiddle music by Mike + Ruthy's Family Band. Meet some of their favorite authors, get books signed, take workshops in everything from building dollhouses with Giselle Potter (This Is My Dollhouse) to creating seasonal poetry with Julie Fogliano (And Then It’s Spring). The theme of the event is Turning Fantasy Into Reality. Wayfinder Experience has designed a literary walk populated with famous fantasy characters to help create a magical environment. The Harry Potter Apothecary will be open for business and brews, potions and spells will be available. The Golden Notebook will be onsite for book sales. The Meadow Cafe will be serving lunch with delectables from the Full Moon Resort and the Applestone Meat Company. The Barn Dance with Mike + Ruthy's Family Band (featuring Jay Ungar, Molly Mason, Lyn Hardy and David Levine) will end the day. Caller Ruth Ungar will teach easy square, line and circle dances. The event will take place at High Meadow School located at 3643 Main St, Stone Ridge, NY. More info and updates about the specific time of the workshop on Facebook. My etsy store is open day and evening and Steven's dog might just be your cashier. I can't tell you how important it is to buy direct from me because when the giant corporate amazonian box stores sell my books, I get about thirty cents. I have a new tumblr. Let's follow each other! My new fabulous intern Alanna Rebbeck helped me set it up. And, hey, she edits a very cool publication called IDEAL and is looking for 200 word submissions. I wrote something and it was super fun and challenging to write only 200 words. Check it out here and send something in! It's going to be so fantastic. This is a print from a splendorous show I recently had the honor to be part of called Secret City. For the show I made 30" x 40" giclee prints of my drawings and they hung from the rafters at Bearsville Theater for the day. If you would like to purchase one of these prints, hit me up! 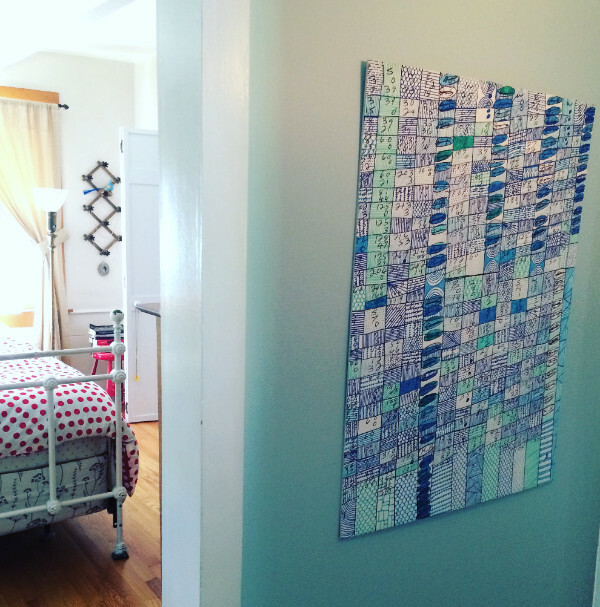 They are $200-$400 for one-of-a-kind giclee prints and would look gorgeous on a wall in your house or office! That's all for now! Thanks for always being there!